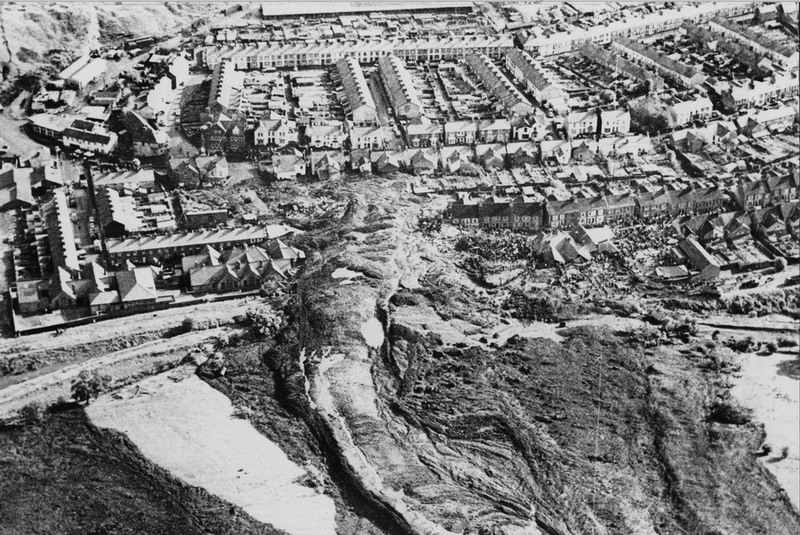 Summary: Today marks the 45 anniverasary of the Aberfan landslide disaster. In this post, Brett Cherry and I review the events of that day and consider the lessons that can be learnt from this the worst landslide disaster in UK history. The story of the Aberfan disaster is seared into the memories of a generation of people in South Wales, and it remains a tragedy of huge proportions. Today, 45 years on from the disaster, there is much to learn from the events leading up to, and that occurred on, the day. In this article, we seek to explain the events that occurred in Aberfan on 21st October 1966, to review why the disaster occurred, and to examine the aftermath. Finally, we briefly examine the legacy that this disaster has left in many spheres of life. Prior to the disaster, Aberfan was just another small, Welsh coal mining village, located in the valleys of South Wales. Essentially the reason for the existence of the village lay in coal mining – it was founded shortly after the first excavations for the Merthyr Vale colliery in 1869. The village was formed primarily of a close knit community of miners and their families, but was sufficiently large to be able to sustain both a primary and a secondary school. Pictures from the post-War period show that the hills above the village were dominated by a series of enormous spoil heaps. Dealing with the waste is a perennial problem in coal mining, which often generates large volumes of dirty material that has little economic use. In South Wales, as elsewhere, it was common to pile the waste close to the mine workings – in the case of Aberfan on the slopes above the village. Mining at Aberfan started in 1869; initially the waste was dumped in tips on the slope adjacent to the mine. However, as the volume of material increased, new tips were built on the slopes higher up the hiollside. By 1969, seven tips had been constructed. Tip 7, from which the disastrous landslide developed, was started in 1958, and reached a height of about 40 metres. It contained about 230,000 m3 of waste. The material was transported to the tip on trams that were hauled up an incline by a series of motors, before the waste was dumped on the tip by a crane. The Commission of Enquiry noted that when coal waste tips are concerned, “water is undoubtedly the root cause of most failures”. This was not a new finding – indeed it had been known for at least 40 years – and 45 years on it is still the case. This area of South Wales has a wet climate (average rainfall is about 1500 mm per year), and the hillsides are marked by lines of springs. The presence of these springs on the hillslopes above was noted on Ordnance Survey maps dating from the late 19th Century. Remarkably, some older tips at Aberfan built on springs or watercourses had previously failed – for example, Tip 4 slipped in 1944, and Tip 5 had a large bulge that was considered to be an indication that it was unstable. Furthermore, just down the valley of Abercynon, a landslide developed in a tip in 1939 that buried a road to a depth of nearly seven metres. And so, the arguments that the events at Aberfan were unprecedented, or could not have been anticipated, cannot be sustained. In the years leading up to the landslide, water from the hillside had been a perennial problem for the people of Aberfan. Starting in 1949, and possibly earlier, a series of floods had affected the upper part of the town, causing damage and disruption, and leaving a legacy of a “slimy black deposit” in its wake, which was almost certainly mine waste. The people of the town repeatedly wrote to the Council and the National Coal Board asking for this problem to be addressed to no effect; it is ironic that in the aftermath of this disaster this flooding issue was solved through the construction of a simple culvert. The disaster itself occurred on 21st October 1966 at about 9:15 am. The day was calm and sunny at 7:30 am, when the team of men responsible for the dumping of mine waste on Tip 7 arrived for work. At the top of tip 7 they found that it had subsided by about three metres. The team had to send a messenger down to report this information to the mine managers as the telephone was out of action as a result of the repeated theft of the cable. A decision was taken by the mine managers to cease tipping at that location, and an additional team was sent up to move the tipping infrastructure back from the area of active movement. By the time they reached the top, the subsidence had further developed, with another three metres of movement being reported. The final, catastrophic collapse developed apparently spontaneously as an initially-rotational movement that rapidly transitioned into a flow. About 107,000 cubic metres of material flowed down the hillside and into the village. Descriptions of the event from eye-witnesses bring home the suddenness and catastrophic nature of the landslide. Most witnesses report a noise that sounded like a jet plane passing low over the village; the witnesses also describe a wave of debris, higher than a house, moving fast and demolishing houses “like a pile of dominoes”. The landslide behaved like a liquid, but with twice the density of water, sufficient to demolish everything in its path. Some victims who escaped the main flow were struck and injured by flying debris. By the time the landslide stopped, it had demolished Pantglas Junior School and 18 houses, and had seriously damaged the secondary school and many more houses. A total of 144 people were killed, including 116 children. Of these, 109 children, mostly aged between seven and ten years old, were killed in the primary school, together with five of their teachers. It is a mercy that lessons in the secondary school did not start until 9:30, meaning that many of those children were still walking towards the building at the time of the landslide. The eye-witnesses report that when the landslide stopped there was complete silence: for example a local hairdresser who witnessed the landslide reported that “In that silence you couldn’t hear a bird or a child”. Immediately people flooded into the area from far and wide to try to save the victims buried by the landslide, including miners from the colliery. News footage from that day shows numerous pit workers in their colliery helmets digging at the site of the school (this footage can be seen here – it is extraordinary bur very moving to view). However, conditions were exceptionally difficult – the landslide mass had drained almost as soon as movement ceased, leaving a dense, cohesive mass that was difficult to excavate. At the school site there was little room to manoeuvre. The last living victim was extracted before 11 am, less than two hours after the landslide. Immediately following the disaster a Tribunal was appointed to investigate the events leading up to the disaster at Aberfan. The Tribunal found that the National Coal Board was entirely responsible for failing to act to prevent the disaster. Throughout most of the proceedings of the Tribunal, the National Coal Board sought to deny responsibility, but by the end of the proceedings the report notes that “however belatedly, it was conceded by the National Coal Board that the Aberfan Disaster stemmed from their failure to initiate any policy with respect to the siting, control, inspection and management of tips”. The NCB was found to be at fault by the Tribunal for placing a tip on a site that had not been properly investigated. Evidence brought forward by residents of Aberfan revealed that the spring underneath Tip 7 was far from ‘unknown’ as originally claimed by Chair of the NCB, Lord Alfred Robens. The worker who reported the first sinking of Tip 7 on the day of the disaster told the judge of the Tribunal, Lord Justice Edmund Davies, that “no one walking on the mountain before Tip 7 was started could fail to see the stream and the spring”, nor did they require any surveying or engineering expertise to see that the site was unsuitable for the tip in the first place. The Tribunal named nine members of the board as being directly responsible for the event, and specified in some detail how their actions led to the catastrophe. However, perhaps surprisingly when seen from the perspective of modern times, no-one was prosecuted for causing the deaths of the 144 people and for the physical and social ruin of the community of Aberfan. According to a 2000 report funded by the ESRC on the government response to the disaster, senior officials of the NCB were not prosecuted because UK governments of the late 1960s and early 1970s “needed their help in the ‘high politics’ of running down the coal industry without provoking a national strike”. Since the NCB was treated as if it were a government department, making them pay the environmental or direct costs of the disaster was considered to be unwise as it would have increased the governmental deficit, which would then have to be recovered from general taxation. Furthermore, the report suggests that the interests of the people of Aberfan simply did not have any sway over policymakers and according to laws in place at the time relating to corporate negligence, no regulatory offence was committed during the Aberfan Disaster because no miners were killed. After the disaster, a fund was created that attracted donations of £1,750,000 (equivalent to about £30 million today), with money being received in the form of more than 90,000 contributions from over 40 countries. This fund distributed the money in a number of ways, including direct payments to the bereaved, the construction of a memorial, repairs to houses, respite breaks for villagers and the construction of a community centre. However, the fund itself attracted considerable controversy. First, when the fund was created it did not include any representatives from Aberfan itself; subsequently, after protests from the villagers, five places through democratic election were created. Remarkably, no other members of the disaster fund were elected democratically. Second, in the aftermath of the disaster the NCB and the Treasury refused to accept full liability, and thus to fund the removal of tips that still loomed above the village. Lord Robens claimed that it was too expensive to remove the tips, with an estimated cost of £3 million pounds. In response, the community of Aberfan formed a Tip Removal Committee to actively seek out contractors for estimates to remove the tips. Eventually the tips were removed by the NCB, but using £150,000 that Lord Robens appropriated from the disaster fund. Understandably, this caused long-term resentment in the community. In 1997, this sum (but without interest) was repaid to the fund by the UK government. The village of Aberfan continues to be profoundly affected by the disaster in 1966, despite the change in population that accompanied the closure of the colliery. According to a psychiatric study that undertook a follow-up of the disaster in 2003, many people who lived through the Aberfan disaster continue to suffer regular bouts of post-traumatic stress. However, the majority of survivors refused to participate in the study. In common with observations with large-scale disasters in other locations, soon after the landslide the birth rate of Aberfan and Merthyr Vale increased dramatically, such that by 1972 it has been calculated that more additional children had been born than had been lost in the tragedy. This is a phenomenon known as biosocial regeneration, which is a subconscious response primarily by couples who had not lost a child in the disaster. The Aberfan Disaster also led to detailed studies of the behaviour of mine waste, and in particular of their potential to undergo apparently spontaneous catastrophic collapse. Research into this mechanism continues today, but sadly mine waste failures remain common, especially in less developed countries. For example, in September 2008 a mine waste landslide struck the village of Taoshi in the Shaanxi province of China, killing at least 128 villagers. Of course, in the UK the disaster led to major changes to the ways in which mine wastes are managed, and there has been no repeat of this dreadful accident. Since the accident, coal spoil tips have been treated as engineering structures requiring proper design and maintenance. A Derelict Land Unit was setup in Cardiff not long after the disaster to restore brownfield land, including former sites of collieries and land used by the coal industry. New ways to dispose of colliery spoils have also been developed. The dreadful calamity of the Aberfan landslide disaster remains perhaps the most poignant and memorable disaster in the UK since the Second World War. The combination of a failure of responsibility by the relevant authorities, the dreadful events in the moment of the landslide, the heroic but mostly futile rescue attempts, and the appalling behaviour of some parties in the aftermath of the disaster created an extraordinary mix from which there is much to learn. There are some positive legacies of the disaster, most notably the dramatic improvements to the management of mine wastes, but there is still much to do to ensure that these lessons are learnt internationally. Its disgusting that the people of Aberfan were robbed of £150,00 to remove the remainder of Tip 7 which caused the Disaster and cost the 144 lives inside Pantglas School 116 of them were children. 31 years on the community of Aberfan were re-inbursed but without interest. If anything the Government should have compensated into the ‘millions’ not thousands bracket. they seem to find money to fund 3rd world countries. The victims families would have got some closure if only the correct amount was refunded with interest and help them rebuild their lives properly. I remember this as if it were yesterday and it was awful. I remember the men digging for their children . Every few minutes they stopped digging and shouted but there were no replies just deafening silence. God Bless them all . The memorial to them is beautiful but it is an event that should never have happened. I am a musician in Massachusetts long at work on a piece for Aberfan. Would you be willing to talk /write with me, to say more about the things in your post from several years ago? ABERFAN DISASTER. Was It The UK’S 1st Televised PSYOP? | WHERE IS THE OUTRAGE? ?